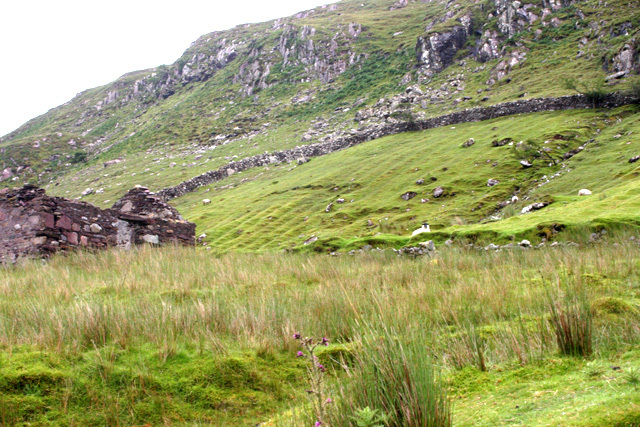 On the steep sides of Killary Harbour, adjacent to the 'famine road' built as part of a poor relief scheme during the potato blight of 1845-49, there are a number of abandoned farms. In the field above the derelict building you can see the parallel banks created by earthing up a potato crop over a period of years. © Copyright Kevin Danks and licensed for reuse under this Creative Commons Licence. This page has been viewed about 2248 times.